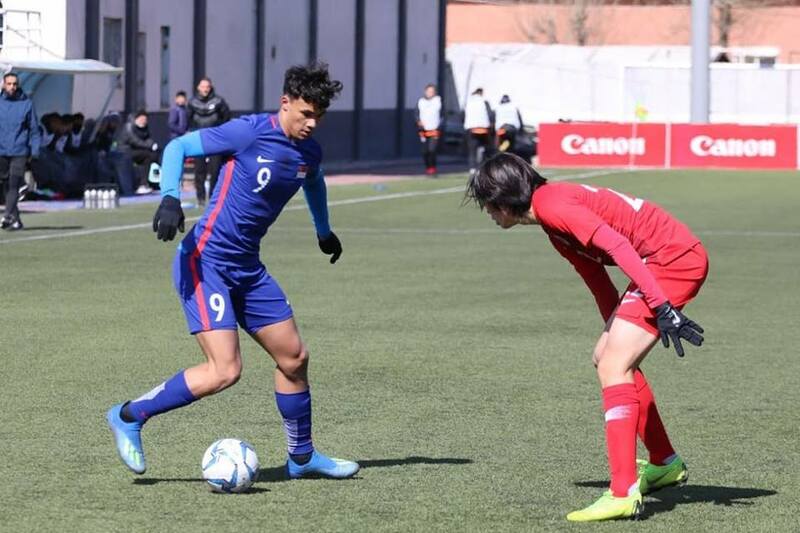 ULAANBAATAR, 24 MARCH 2019 – Singapore failed to hold on to an early lead as they were held 1-1 by DPR Korea in the Asian Football Confederation (AFC) Under-23 Championship qualifiers on Sunday afternoon. Having drawn 1-1 with Hong Kong in their Group G opener two days ago, Fandi Ahmad’s Under-22s were fired up to get their first victory and got off to a superb start at the MFF Stadium. Hami Syahin won the ball near the halfway line and picked out Ikhsan Fandi on the left wing, who headed straight for goal and beat Jung Kum Song before firing a shot in at the near post for a superb individual effort. But the advantage lasted just six minutes as the Koreans, who had won their opening game 1-0 against Mongolia, swiftly pegged Singapore back. A precise pass from Kang Kuk Chol found Pak Kwang Hun in the box and he held off two challenges to smash the equaliser past Zharfan Rohaizad. Zharfan was kept busy in goal as the Koreans found their rhythm and the Young Lions custodian saved tame efforts from Kim Kum Chol and Pak, before pulling off a superb double stop on 37 minutes to deny Ri Chung Gyu and then Kim Kuk Jin. The Singapore goalkeeper continued his good form after the break to keep his side in the game, though his team-mates found it tough to make much headway at the other end despite pushing hard. Singapore take on Mongolia in their final group game on Tuesday, 26 March at 5pm. Singapore: Zharfan Rohaizad (GK), Lionel Tan, Irfan Fandi, Irfan Najeeb, Zulqarnaen Suzliman, Joshua Pereira (C), Jacob Mahler, Syahrul Sazali, Hami Syahin (Naqiuddin Eunos 90’+3), Ikhsan Fandi, Amiruldin Asraf (Haiqal Pashia 74’). Unused subs: Kenji Rusydi (GK), Adib Nur Hakim (GK), Akram Azman, Danish Irfan, Nur Adam Abdullah, Amirul Haikal, Nur Luqman Rahman, Arshad Shamim, Syukri Bashir.